Wednesday was Eichler Day, in tribute to the developer Joseph Eichler (1900-1974), who built some 11,000 glassy post-and-beam homes in the 1950s and 1960s, mostly in California. Though Eichler houses were mass-produced for middle-class buyers, they were beautiful and forward-looking. At a time when most tract developers were building simple ranch-style houses, Eichler hired the modernist architects Robert Anshen, A. Quincy Jones and Raphael Sariano. The homes they designed had exposed rooflines and glass walls, interior garden courtyards, open kitchens and easy transitions between the indoors and outdoors. It wasn’t just the homes that were different. Eichler tracts had shared open spaces and pools that fostered a sense of community among their owners. (To this day, Eichler communities have annual block parties; Eichlerites march in groups in local parades.) Unlike other developers of his time, Eichler refused to discriminate against non-white buyers, selling to anyone who could afford one of his houses. His color-blind policy struck a blow against the prevailing segregated housing practices and seems even more significant in retrospect. 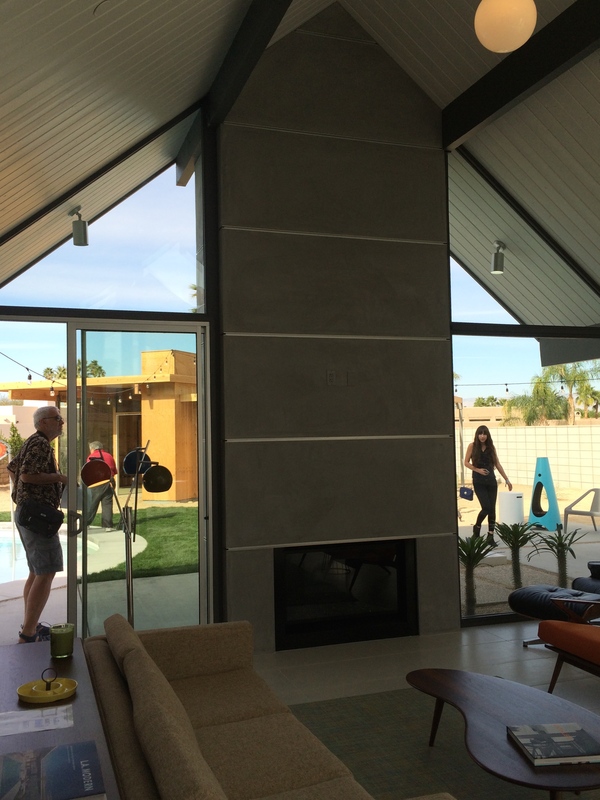 The highlight of Modernism Week’s Eichler Day was a brand-new Eichler home, the first in Palm Springs, built on spec from plans licensed from his estate. I toured it with my friend Steven Corley Randel, a residential architect who lives in Palm Springs and works all over California and Hawaii. There were various updates to the original design, both in materials (such as insulation and glass) and style. The exterior was jazzed up with an orange front door and trim; inside the roofline was painted white, a glaring change from Eichler’s unpainted wood, and one that highlighted every imperfection. Still, the house was Eichlerian in spirit: the open plan made it seem more spacious that its 2,500 square feet, as did the soaring glass walls. The only claustrophobic feature was also original–the extremely narrow hallways. As Steve pointed out, they didn’t meet today’s building codes; “I wonder how they got away with it?” he said. Outside, things were considerably less Eichlerian. The yard was fenced and featured an inauthentic round pool–why not a kidney-shaped one? 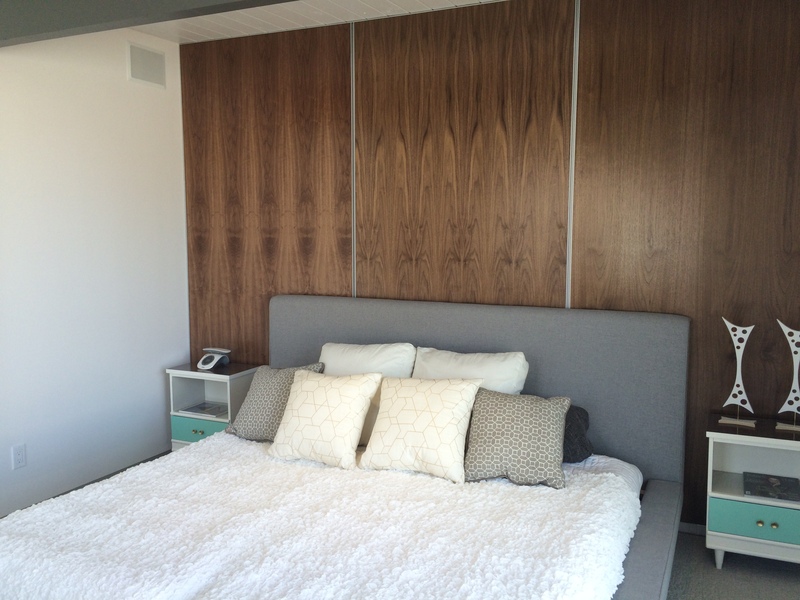 But the most discordant feature was the one-bedroom guesthouse, still under construction, an addition that never would have occurred to Eichler and his architects. 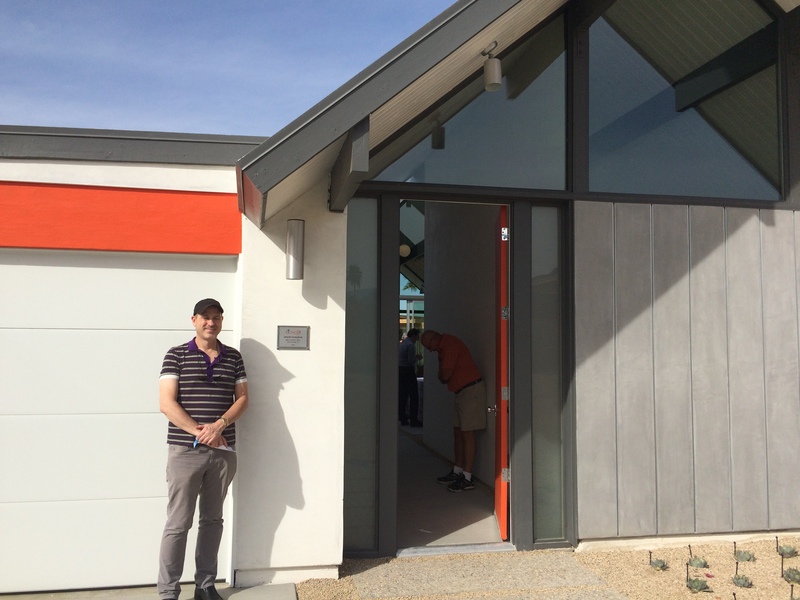 All in all, the new Eichler seemed to go over well among those who toured it. Despite my quibbles about the updates, the biggest problem was its listing price of $1,290,000, an astronomical sum for a house that cost $12,000 (about $90,000 in today’s dollars) in the mid-1960’s. While it’s true that Eichler houses have much more cachet today than they did when they were popping up by the thousands (a fact that has led the builders of the Palm Springs house to plan several more), the difference in cost is astounding. However fancied-up, in the end it’s still a tract home, meant to be mass-produced for very little money. For $1,290,000, you could have a custom-designed house by a living architect. The fact that someone preferred to spend that amount on a budget house by a long-dead developer says nothing about Eichler’s times and a lot about our own. My mother often asks how she and my father can see the Academy Award nominees for Best Foreign Film, Best Documentary and Best Short Feature. My answer is always disappointing: it’s difficult, even for those living in New York and Los Angeles, to see them. For those who live elsewhere, it’s nearly impossible. But this year at least one nominee for Best Foreign Film is easy to watch: Pawel Pawilkowski’s “Ida,” on Netflix. Set in 1962, “Ida” is the story of a convent-raised orphan who, on the eve of taking her final vows to become a nun, is instructed by her Mother Superior to meet her only living relative, the aunt who refused to claim her. The young novitiate, Anna, does, and immediately learns that her real name is Ida Lebenstein, and that her Jewish parents were murdered by their Catholic neighbors during World War II. Her aunt Wanda, a resistance fighter during the war, became a prosecutor afterwards, punishing war criminals. But when she meets her niece, she is no longer working and deeply embittered, a lonely, promiscuous woman with a drinking problem. After initially rejecting Ida–clad as always in her nun’s habit–Wanda takes her to the family village to learn the truth about her parents’ deaths. Shot in black-and-white, “Ida” is visually stunning, full of painterly, beautifully composed shots. The fact that actress who plays Ida, Agata Trzebuchowska, looks like a Vermeer subject only adds to the effect. The journey undertaken by the two women is fascinating, as it concerns not only the past but the present and future. Will Ida take her vows after finding her Jewish roots and tasting secular life? Will Wanda (the excellent Agata Kulesza) still be part of her life? http://www.pch24.pl/an-oscar-for-murderers,33543,i.html#ixzz3PeNHaSQN to a virulent review of “Ida” in a Polish Catholic newspaper. “I didn’t think it was a documentary,” I responded. Neither should anyone, but as “Ida” proves, some wounds don’t heal. You are currently viewing the archives for February, 2015 at Under the Hollywood Sign.